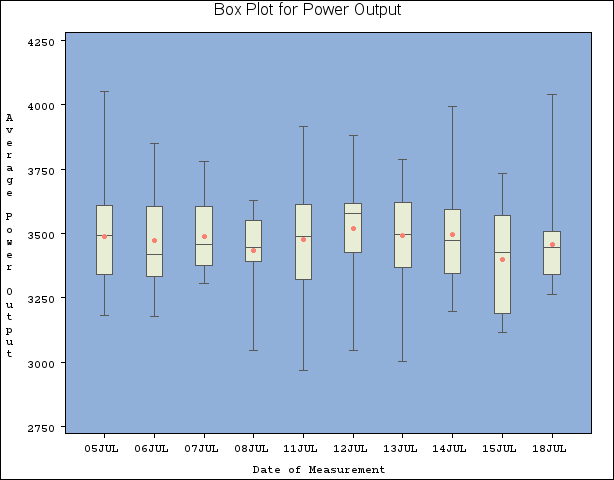 The previous example illustrates how you can create box plots from raw data. However, in some applications the data are provided as summary statistics. This example illustrates how you can use the BOXPLOT procedure with data of this type. Oilsum contains exactly one observation for each group. Note that, as in the previous example, the groups are indexed by the variable Day. A listing of Oilsum is shown in Figure 28.2. KWattsL contains the group minima (low values). KWatts1 contains the 25th percentile (first quartile) for each group. KWattsX contains the group means. KWattsM contains the group medians. KWatts3 contains the 75th percentile (third quartile) for each group. KWattsH contains the group maxima (high values). KWattsS contains the group standard deviations. KWattsN contains the group sizes. You can use this data set as input to the BOXPLOT procedure by specifying it with the HISTORY= option in the PROC BOXPLOT statement. Detailed requirements for HISTORY= data sets are presented in the section HISTORY= Data Set. The NOGSTYLE system option causes PROC BOXPLOT to ignore ODS styles when producing the box plot. Instead, the SYMBOL statement and options specified after the slash (/) in the PLOT statement control its appearance. The GSTYLE system option restores the use of ODS styles for subsequent high-resolution graphics output. For more information about SYMBOL statements, see SAS/GRAPH: Reference. The resulting box plot is shown in Figure 28.3.